Purdue Computer Science would like to welcome three new faculty members. Jennifer Neville, Luo Si, and Xiangyu Zhang will join the department in the fall of 2006. Dr. Jennifer Neville will join Purdue as an Assistant Professor with a joint appointment in Computer Science and Statistics. She received her PhD in Computer Science from the University of Massachusetts Amherst in August 2006. She also received her MS in 2004 and her BS in 2000 from the University of Massachusetts Amherst. Dr. Neville was the recipient of a DARPA Young Investigator Award in 2003 and was part of the team that won the 2003 Knowledge Discovery and Data Mining Competition. Dr. Neville's research focuses on data mining and machine learning techniques for relational data. In relational domains such as bioinformatics, citation analysis, epidemiology, fraud detection, and web analytics, there is often limited information about any one entity in isolation, instead it is the connections among entities that are of crucial importance to pattern discovery. Her research interests lie in the development and analysis of relational learning algorithms and the application of those algorithms to real-world tasks. Dr. Luo Si will join Purdue as an Assistant Professor of Computer Science. He received his Ph.D. from Language Technology Institute, School of Computer Science, Carnegie Mellon University in May 2006. He also received an MS in Computer Science at CMU as well as an MS from Tsinghua University in Computer Science. His BS from Tsinghua University is also in Computer Science. Dr. Si received the National Excellent Student Research Award in China in 1998. In 2004, he received the Best Presentation Honorable Mention at the CMU Student Research Symposium. Dr. Si's research spans a range of topics in information retrieval, machine learning, text mining, speech and multimedia processing, and data mining. His recent research focuses on federated search (distributed information retrieval), probabilistic models for information filtering, and text/data mining for life science. Dr. Xiangyu Zhang will join Purdue as an Assistant Professor of Computer Science. He received his PhD in Computer Science from the University of Arizona, Tucson in May 2006. 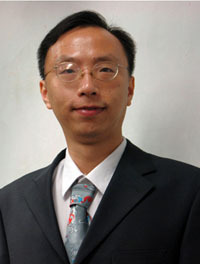 He received his MS and BS in Computer Science from the University of Science and Technology of China in 1998 and 2000, respectively. Dr. Zhang's research is on automatic debugging, software reliability,computer security, and program profiling. In particular, he has designed efficient and effective dynamic slicing techniques which have a lot of applications in debugging runtime errors, intrusion detection, and preventing software piracy. Zhang is interested in program analysis, both dynamic and static, and their applications in software engineering and security related issues.